We love visiting Falmouth Village. There are lots of cute shops and great places to eat. It is a real treat for us to be able to take a few hours off from the inn and head down for lunch. We used to love to go to Laureen's on 170 Main Street. Several years ago they closed and the eateries that appeared in that location have never quite made the grade. At least not until now with the Pickle Jar Kitchen. This charming restaurant is the joint venture of Benjamin and Cassandra Gallant and Kevin and Elisabeth Lay. Benjamin has been chef at several well-known Cape restaurants and he and Cassandra operate Dine Catering. The Lays are the owners of Butterqueen Cakes, whose bakery items are served at the restaurant. 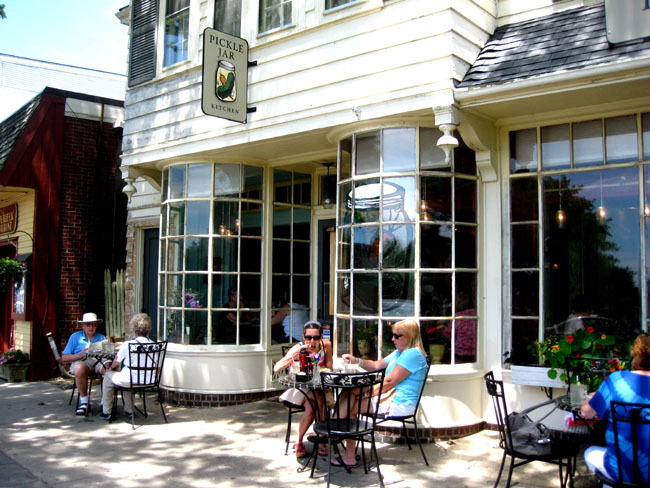 The Pickle Jar Kitchen serves breakfast and lunch every day but Tuesday, when they are closed. The menu items are interesting and contain wonderfully fresh ingredients. The salads are beautiful and have unique combinations of ingredients, as do their "Sammiches". The Chicken, Kale, and Quinoa soup is wonderful. My personal favorite menu item is the Quinoa Tabouleh Platter and Charlie is quite partial to the Nobska Light Sammich, which has their house-cured salmon pastrami, pea shoots, carrot curls, shaved marinated fennel, mixed greens with a herb-yogurt dressing in grilled lavash. It is beautiful as well as tasty. Their House Fries are amazing as are the Fried Pickle Chips. Of course, most of their lunch items have pickles on the side and their iced tea is served in pickle jars. So charming. are the Mexi-Cali Carrot and Jalapeno, Spiced Pickled Red Onion, Marinated Mushrooms, Olives and Capers, and their House Garden Pickle which is seasonal veggies in champagne dill vinegar. The varieties are for sale at the restaurant. 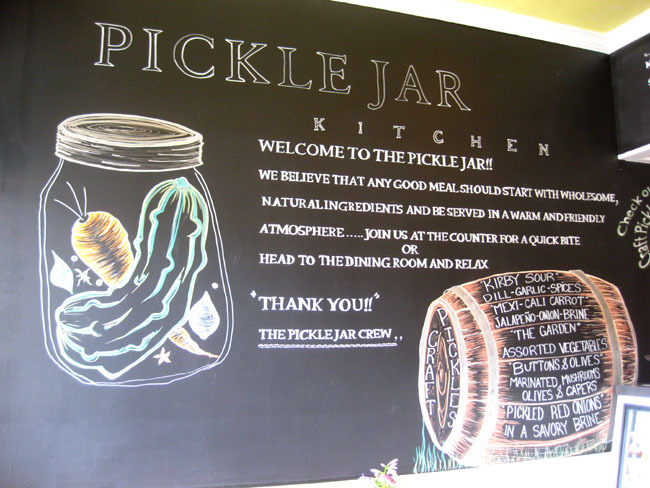 Next time you are in Falmouth, stop by the Pickle Jar Kitchen for a bite. You can sit inside in their cute dining room or grab a table outside. You'll love the food. The menu is available on their website.